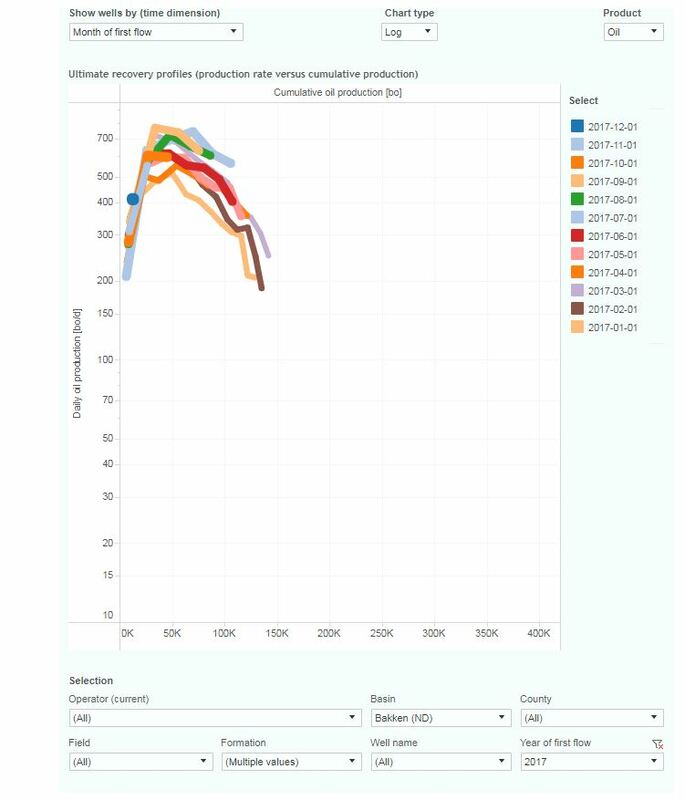 This interactive presentation contains the latest oil & gas production data from all 13,125 horizontal wells in North Dakota that started production since 2005, through December 2017. Oil production in North Dakota for December came in 1% lower compared with the previous month (1,181 kbo/d vs 1,197 kbo/d). After 2 years of falling output, 2017 showed a remarkable recovery in the Bakken, almost back to the previous high in Dec 2014. In fact 2017 displayed the strongest year over year growth except for 2014, despite that only 995 wells were put on production, a lower number than in any of the years between 2011-2015. The reason behind this is that initial well productivity is significantly higher, as you can see in the ‘Well quality’ tab. On average, a 2014 well did 58 kbo in the first 6 calendar months, while for wells that started in the first half of 2017 this metric rose to 96 kbo, a 65% increase. Based on the data so far, EURs don’t appear to be up by the same percentage though, as most of these improvements appear in the first 1-2 years. The number of drilled, but uncompleted wells dropped somewhat in 2017 (751 vs 828), as shown in the ‘Well status’ tab. Continental Resources, the leading operator in the Bakken, has been more aggressive with completing this inventory, while not drilling many new wells. You can see this by selecting this operator in the ‘Operator’ selection. 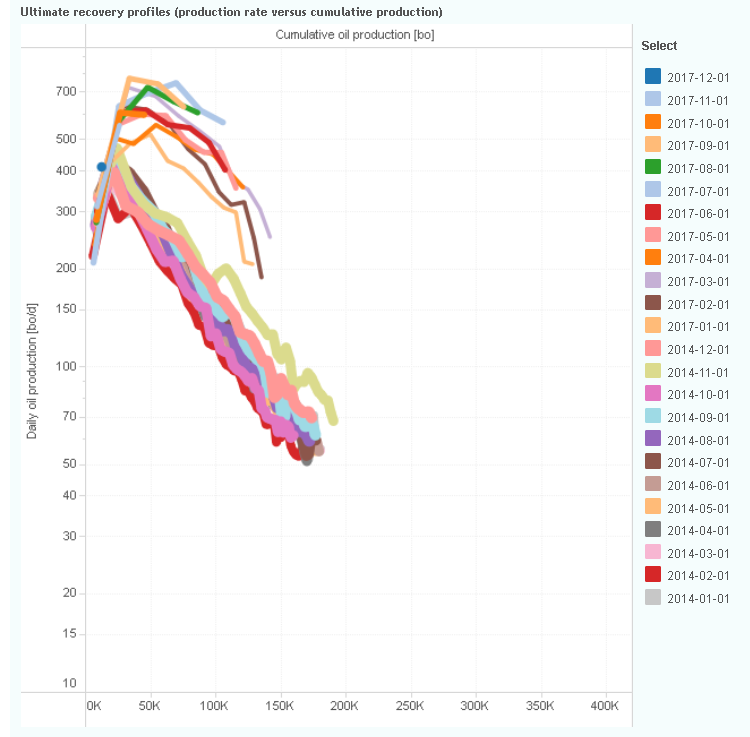 This “Ultimate recovery” overview shows how all these horizontal wells are heading towards their ultimate recovery, with wells grouped by the year in which production started. It clearly shows how early well behavior has improved over the years. But it’s also interesting to see that, on average, the wells from 2012-2014 are now starting to track a lower recovery than the 2008-2011 wells. A factor behind this is that more of those earlier wells have been refracked, but I think that this effect holds up when you correct for that. This is an area that I want to provide more insight on in the coming year. If you change the ‘Show wells by’ selection to ‘quarter of first flow’, wells will be grouped by the quarter in which they started. It offers a more detailed, and recent, view, and will show how early performance has kept improving in 2017. Next week I will have a new post on the Niobrara. Didnt someone ask about front loading (acceleration) versus actual increasing EUR (reserve development). If the first 3 months of 2017 are an indication, then indeed there appears to be a steeper drop-off after about 10 months or so. As a comparison, see 2014 also included here below. Still need a couple of more months to verify this. Bakken new well gas/oil ratios are increasing each year. Operators are moving to more gassy areas. GORs start higher but also grow more rapidly, which could mean oil production decline rates will be steeper than they used to be. Indeed GOR is increasing, and rising more rapidly for newer wells. The shifting of focus is probably part of the answer, but I just checked the GOR within the main fields of McKenzie, and also within these fields you can see the same phenomenon. Therefore I suspect it also has to do with other factors (completion techniques?). That is interesting. If the initial GOR is not materially different from the older wells, rapidly rising GOR would suggest they are producing new wells faster (and subsequent decline could be steeper). After all it is the expansion of solution gas that is driving oil out of LTO reservoirs. Maybe, somehow, one of the reasons is a rising share of infill wells. 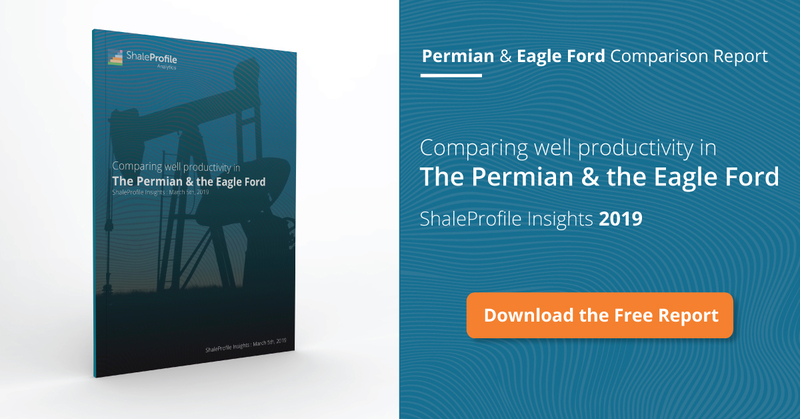 A Rystad report lately blamed the infill wells for recent poor Eagle Ford production. Thanks for the enormous amount of work that this website represents. I understand that horizontals are getting longer (is this true of the Bakken? ), is there any way that production per horizontal foot could be estimated – has the average horizontal length per year been recorded anywhere?. On the Get-the-Data page all underlying data of the presentations here are available, and much more, including lateral lengths, proppant volumes, etc. I’m currently working on an analytics and data service to make it far easier to analyze also these kind of questions (well performance per lateral foot). But to answer your question, lateral lengths have indeed increased in all basins in recent years, as did proppant volumes. However, in most other basins these lateral lengths increased more than in the Bakken, as here they were already quite long in the early years (2008-2010). Thanks Enno, I wondered how much of the initial production increase was due to increased horizontal length, how much to hunting down the best parts of sweet spots, how much to getting more sand per foot etc. I understand that the shale oil industry has accumulated 300 billion in debt, its service industry has built up debt, and on top of that shareholders have put a lot of cash in. If one divided the number of barrels of shale oil by total cash/debt input to date it seems, overall, to be a very puzzling enterprise, though some wells no doubt have turned a profit. Isn’t it ironic that this “Fracking”(sic) turns out to be one of the biggest wealth re-distribution programs ever from the investing class to the impoverished class at the gas pump and burner tip. And those who despise fracing the most would generally be those much in favor of the wealth re-distribution. “Puzzling” indeed. Take a gross well head price of $60 per barrel, deduct ALL costs and use a net- back, take home pay of $28 per barrel, across all major shale oil basins, and that industry must now produce almost 11 billion barrels of oil…just to get out of debt. Those are barrels that cannot be used to maintain production, or grow reserves for the long term benefit of America, that is what will be required to get back to even. Its a business, shale oil extraction, and the business is failing.